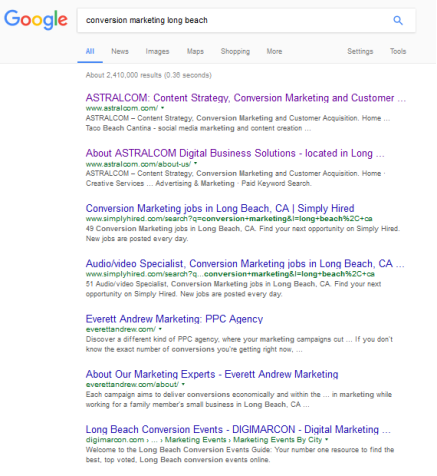 2017: When Google Became the Face of Your Business | ASTRALCOM - Content Strategy, Conversion Marketing and Customer Acquisition. Last year we worked with each of our clients to define how their buyers use the Internet to help them decide on which brands they’re going to buy from. We demonstrated that, in nearly all cases, prospective customers start their buyer journey with Google. Typically, this kind of search is keyword or keyphrase related. So, unless your brand has organic and/or paid search representation, you’re missing out on the start of most customers’ buying journey. After this point, unless they’re considering your brand in their decision-making process, you’re probably not in the mix. In the event that you’re brand has connected with potential buyers during their initial search, the next search-related opportunity your brand has to engage with them is toward the end of their journey; when they do a brand name search, related to the brands they’re deciding on. This is where buyers are looking at what comes up under a search for your brand name. Ideally, you’ll want buyers to see your corporate website, your social media sites, posts and any other 3rd party referring sites. It’s fair to say that if your brand isn’t appearing during buyers’ initial exploration, they likely won’t do a search for your brand name and you probably won’t even end-up as being considered. Yet, in both cases (generic and branded searches), buyers are using Google and what shows on page 1 of Google is always – and will continue to be – prime real estate for brands. Managing how and when your brand engages buyers is important at each point along the buyer journey. Ensuring that Google accurately represents your brand in search-related instances is critical. 2017 is the year to Get Your Google in Order! Contact the experts at ASTRALCOM to help you get it done. Richard Bergér is the VP of E-Business for ASTRALCOM, an integrated media services company located near Los Angeles, California. Richard draws on his military and psychology backgrounds to create pervasive content strategies, motivating conversion tactics and targeted audience acquisition for clients. Connect with Richard via his LinkedIn profile. What’s the Average Click-thru Metric for PPC? For Display? 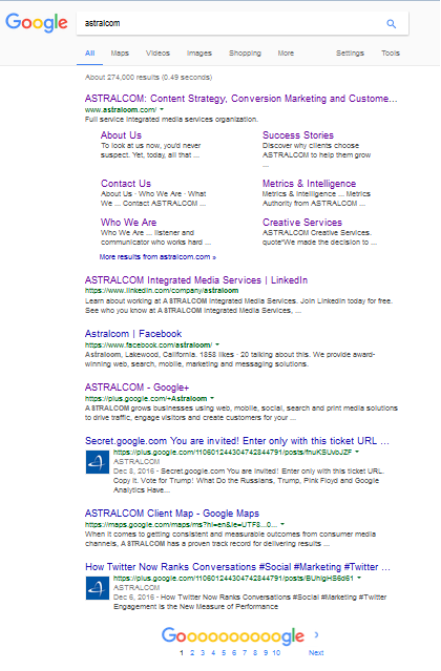 ASTRALCOM Grows Businesses using Content Strategy, Conversion Marketing and Customer Acquisition. Sorry, but ASTRALCOM no longer supports the IE7 browser. Please upgrade. Schedule a FREE 20-minute digital marketing Q&A session with Richard via phone. You’ve got questions and Richard has the answers.